First impressions matter, and the way you present your work can have a big impact on how it’s perceived. If you’re in the market for something that can organize and play your media in an engaging and professional presentation, then slideshow maker software might be a good option. Whether you’re showcasing your past work, pitching a new idea, or need a polished-looking slideshow to impress a client, there are many different kinds of slideshow makers that can help you present your photo and video media like a seasoned pro. And, of course, there are plenty of applications outside the office —organize photos from a family vacation, or create moving presentations brimming with memories for weddings, birthday parties, and graduations. Check out our list of some of the top slideshow maker software available to see which one is right for you. Looking for a slideshow maker with tons of options for personalization? 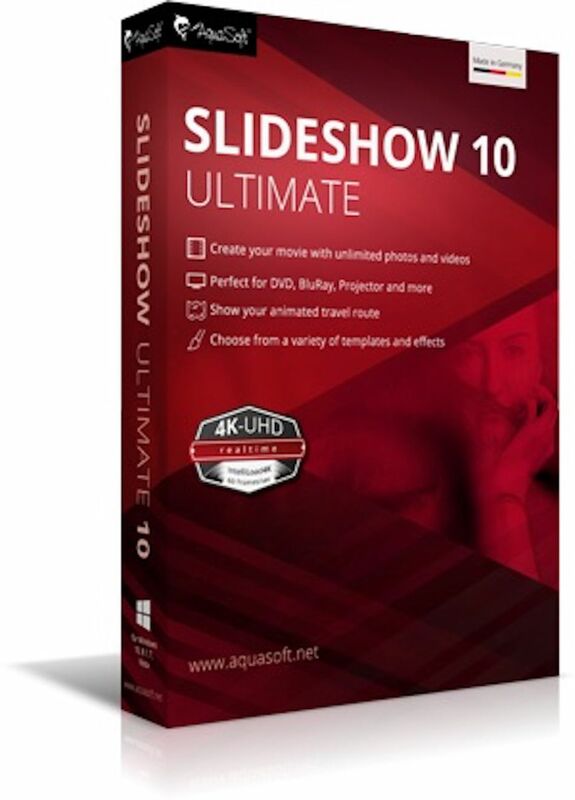 The AquaSoft SlideShow 10 Premium software comes pre-loaded with multiple customizable templates that make it easy to create a fun and professional-looking slideshow for almost any occasion. From weddings to holidays to graduations, there is an easy-to-use template that will make your presentation truly memorable. Give your show a personal touch with thousands of effects, animations, and transitions. Choose from 120 different text animations and 62 different transition types, some of which feature 3D options or lightning effects. Play with color, size, and position to get exactly the look you want. Once your show is ready, you can create HD video, export your video to social media sites including YouTube, Vimeo, and Facebook, or burn your show to a Blu-ray disc or DVD. If you are looking for a basic slideshow maker at an unbeatable price, you won't get any cheaper than the PhotoStage Free Slideshow Maker. All you need is this software and your own photo or video clips to create fun and memorable slideshows. You can even add your own music or pre-recorded narration to create your own soundtrack for your slideshows. A few free photo editing tools such as cropping, flipping, and rotating photos come with this software, allowing you to touch up photos before making your show. Some basic transitions such as cross-fade, zoom, and panning are even included to give your slideshow a more cinematic feel. It doesn't include any additional photo editing, video editing, or otherwise "premium" features that some of the other options on this list do, but it's still pretty robust for a free software. You can also purchase the full Photostage Pro Edition software for a very budget price. If you need a slideshow maker but are also looking for a flexible software tool that can help you capture, edit, and share photos, videos, and audio, then the Roxio Creator NXT 6 is a great all-in-one solution. In just one piece of software, the Roxio Creator NXT 6 combines 15 different Roxio products allowing you to accomplish everything from moviemaking to burning CDs to converting video files. One of those products is Corel FastFlick, which enables you to make a movie or slideshow in just three steps with built-in templates. This software also comes with interesting effects that can be used in slideshows, like motion blur or track transparency. You can even work with footage from two different cameras to create more dynamic videos. Plus, the VideoWave video editing software gives you access to the ScoreFitter music library, allowing you to select from a huge library of original, royalty-free songs and effects to add a professional touch to your show. If you want a slideshow maker that practically does all the work for you, check out the Movavi Slideshow Maker 3 Personal Edition. Use the Slideshow Wizard mode to create a complete slideshow presentation in just three steps. Simply upload your photos, choose a transition style, and select a soundtrack from the available options. Or, if you would rather go for more personalization, choose the Full Feature mode for more options. Full Feature mode allows you to cut, delete, rotate and crop frames so only the best shots are featured. Video editing features include stabilizing shaky videos, adjusting vertically-shot videos, and adjusting colors. Plus, you can insert titles and captions, add music, or apply filters or slide transitions to change the feel of your presentation. You can even start in Slideshow Wizard mode and transition your project to Full Feature mode if you change your mind after getting started. Once you’re done, save your videos and they’re ready to watch on any portable device. Or, upload directly to YouTube from the program for easy sharing. Are you interested in making slideshows but don’t know how to pull together all your photos and videos? Get organized with Premiere Elements 2018. It will search your computer to find relevant files and sort them automatically by date. Try tagging people, places, and events to make organizing even easier. Once you find your files, use the software to expertly edit photos or videos. Add style to your show with freeze frame motion titles, bounce-back effects, and lots more titles, effects, transitions, and themes. Try adding music too – if the song you want to use isn’t the right length, this software has a tool that “remixes” it to match up with your slideshow. Finally, share easily by uploading your slideshow online or burn to a disc for a personalized keepsake. Give your vacation photos that little something extra with the Photo Explosion Deluxe Version 5 slideshow software. Fix flaws and add backgrounds or text to make your photos pop. Add special effects, frames, or props, and use the included enhanced drawing tools to truly personalize your slideshow. Use the easy slideshow maker or create videos, panoramas, or collages. Share quickly by uploading directly to social media sites like Facebook, Flickr, and YouTube. In addition to helping you create engaging slideshows, this software comes with more than 3,000 photo projects including scrapbooks, posters, and cards, so the Photo Explosion Deluxe Version 5 software is a great value.